Has the sun gone in on Tesla’s domestic solar business? Weeks after electric carmaker Tesla announced it was to cut 9% of its workforce, it is also to sharply downsize the domestic solar business it bought two years ago for $2.6 billion (£2bn). The company said the latest cuts to the division, previously named SolarCity, will include closing about a dozen installation facilities and ending a partnership with US retail giant Home Depot. It installed 76MW of its solar systems in the first quarter of 2018, down from the more than 200MW of capacity SolarCity put into place at the start of 2016. Yes, and judging by an article in the paper today their car business isn’t far behind. In an attempt to increase production they’ve set up a manual assembly line in a tent on their parking lot. A HUGE tent. Musk is bragging they outfitted it with machinery that was discarded when automation supposedly outdated it…. apparently too automated for their own good he now admits and a source of their problems. Tesla is proving anyone can make cars of questionable quality, behind schedule, and lose money. 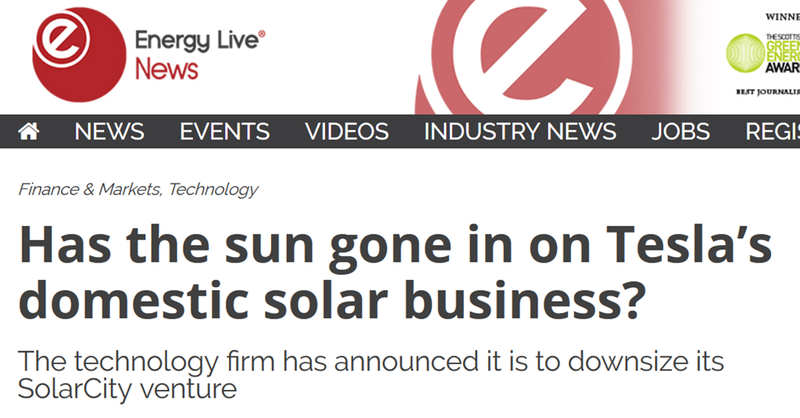 As far as their solar roofs, since the initial hype several years ago almost nothing has been in the press. Quiet. Analysts are saying SolarCity is dragging down the Musk empire so quickly even subsidy increases ….. which will more likely be decreases … can’t help them survive. Oh how the mighty have fallen. He still has his rocket and boring business to float his boat so don’t worry for him. Judging from his recent erratic behaviors with the press he’s accomplishing that on his own. I wish him success but think he bit off more than he can chew. Oh I do want to see “Enron” Musk go bust. Is it the humility of those such as Elon which has you fussed? It will be a day to celebrate when Tesla goes bankrupt. Upsetting the financial world is not a good idea when you need to find billions in finance to prop you up by the end of the summer. I think it is only virtue-signalling drivers and investors that has got it this far. Are there enough to keep it going, at least until the cobalt cliff is reached.